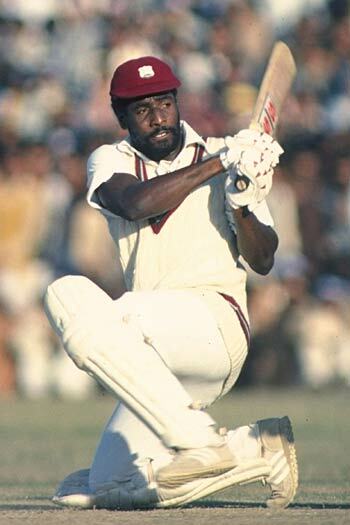 It was the man from the Caribbean who was all about swagger but reliability at the same time. Vivian Richards demolished a capable England attack comprising the likes of Ian Botham and John Emburey, at Antigua in April 1986 in the second innings when the team needed quick runs to enforce a win. Richards’ hundred did that exactly, as it came in just 56 balls and remains a world record till date of the fastest Test century ever scored. This is one of the reasons why Richards was considered amongst the finest batters of his generation and once he retired in 1991, it seemed as if no other player would succeed him well enough. Gilchrist missed out on the world record by an agonizing one ball! But it was England who had to yet again face this humiliation of conceding the second of the fastest centuries as well. He has the maximum number of sixes in Test cricket till date and it is bewildering that it took him this long to score one of the fastest centuries in Test matches. Though, he did eventually at Perth in the Ashes series. His hundred came off 57 balls and the manner in which he attacked Monty Panesar, England’s most successful bowler in the first innings demoralized the opposition completely. On a deteriorating pitch, this innings was crucial in seeing Australia win by 206 runs and in the process, regaining the Ashes back which they had infamously lost a year ago. This was a knock which was scored in a tough situation and the fact that prior to this Test, Gilly had almost made up his mind to retire from Tests following a poor year for him when he was not in the best of nicks. Another Aussie features in this list. Australia played South Africa in a Test match at Johannesburg where John Gregory of Australia broke Englishman Gary Jessop’s record. He reached his hundred in 67 balls, allowing Australia to reach a substantial first innings score in almost a single day. It made South Africa follow on, but they saved the Test match in time. Eventually, Australia went on to gain a historic 1-0 series win out of 3 Tests. In the decade between 2000 and 2010, three centuries have come which can make the list of the fastest centuries in cricket, while there have been more of fastest double centuries scored. It began with Shivnarine Chanderpaul confusing the Aussie bowlers with his unusual V stance in the first Test of the home series in 2003. It helped him score a 69-ball hundred even as none of the other batters scored above 30 in the entire innings. Though Australia won comfortably in the end by 9 wickets, Chanderpaul would rate this as one of his finest hundreds he has ever scored in his career and is the second West Indian to make this list. West Indies has had a dearth of aggressive, yet stylish batsmen over the years and Fredericks is one of them. They began their dominance in the mid 1970s and it co-incided with Roy Frederick’s hundred against Australia at Perth. He was just four balls short of breaking the then world record in 1975 as he scored his hundredth run in the 71st ball of his innings. However, it helped West Indies salvage an innings victory against a powerful Australian side in Australia backyard even as the Windies were crushed in the 6-Test series 1-5. But as far as Fredericks is concerned, he went on to become one of the mainstays of a famous Windies batting lineup for years to come. While in the following year, Pakistan’s Majid Khan scored a 76-ball hundred against New Zealand in Karachi which could have almost helped his side whitewash the Kiwis at home for the first time in their cricketing history, Unfortunately, New Zealand doggedly batted it out in the second innings for a draw. Pakistan went on to win the 3 Test series 2-0, as the Kiwis in those days were easy pushovers especially in the Indian subcontinent. 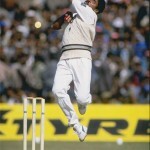 10 years later, India’s champion all-rounder and World-Cup winning captain Kapil Dev equaled Majid’s record and scored the fastest century ever by an Indian against minnows Sri Lanka. He was supported well by Sunil Gavaskar and Mohd. Azharuddin on a batting paradise as India made full use of the conditions. The match eventually ended in a draw but it was not a dull one by any means and the people in the ground had their moneys’ worth to watch one of their cricketing heroes smash the ball to all parts of the ground. It took another decade to see a fast Test hundred. The wait ended due to Mohammad Azharuddin’s blitzkrieg against the Proteas. In 1996, South Africa toured India for the first time since their re-admission in international cricket. They were expected to give the almost invincible Indian team at home, the challenge of their lives. India won the first Test at Ahmedabad, and they could have wrapped up the series at Kolkata with a win. But the team was in trouble after South Africa put up 428 runs on the board in the first innings. While the rest of the Indian batters collapsed, Azhar continued to counter-attack and consequently bought up a 74-ball hundred, which makes him share this national record alongside Kapil Dev. However, this is a rare instance when a counter-attack had failed miserably. India were all out in a mere 81.2 overs and that allowed South Africa to score quickly in the second innings. Eventually, India lost by a massive 329 runs which made the Proteas level the series with one to play. The first ever century scored below a space of 100 balls was in 1902, when there were only a few countries playing Test cricket and the game was in its introduction stage of its lifecycle. Jessop is known in the English cricketing circles till date and that is primarily because he scored a match-winning hundred off just 76 balls against Australia in the Ashes Series at The Oval and saved England’s face in what was a lost series already. It took almost the same time as the football World Cup in Germany and the World Cup in South Africa for another century of this sort to happen. This was from the bat of South Africa’s AB de Villiers and it came against India in a city aptly named ‘Centurion’ last year. India were bowled out for a paltry 136 on the first day of the Test. This gave South Africa all the time in the world to put up a gigantic score to pressurize India. And that is exactly what they did. All the batsmen played at almost 3.75 runs per over on average, but it had to take an AB de Villiers to take that run-rate up to 4.76 in the end as he bought up a 76-ball hundred which involved 12 fours and 5 sixes. The Indian bowling was belted all around and a total of 620 was not facile for India to catch up with. Once again, it is unlucky that de Villiers will not be remembered for this innings since Sachin Tendulkar bought up his 50th Test hundred in the second innings, despite that going in a losing cause. Yet, de Villiers is the only man to feature in the list of the top 10 fastest hundreds in both ODIS and Test cricket. Cricket needs more of such hundreds, even if they are like cameos these days with batsmen aiming more for double and triple centuries with T-20s making run-scoring much faster than the old days. It will help prolong a declining Test format, which is rightly the ultimate Test for any cricketing nation and its pride in the sport.